Quick Credits Edit: The font used in the game is the Larua font by Jupiter Hadley!! Q: Why are you putting out the demo now even though you acknowledge it's not finished? A: It's mainly my disillusionment with RPG Maker MV. The thing is, the engine's just not very well optimized. My computer has trouble running it properly it without the occasional lag spike. Every game made in MV has run badly on my computer and it's been a general issue that I've seen with people. It's a completely subjective problem, since it can run perfectly fine for some people (like that Driftwood Gaming person). And so I asked myself: "why bother to keep working on something that only a few people could properly enjoy?" Basically, Treasure Quest!! is starting to suffer a bad case of feature creep, and as a solo dev, it's become something unreasonable, even if RPG Maker MV worked perfectly. Honestly, if I'm going to revisit this, it's going to have to be massively scaled back. And if I do that, it may as well be in a different engine entirely. 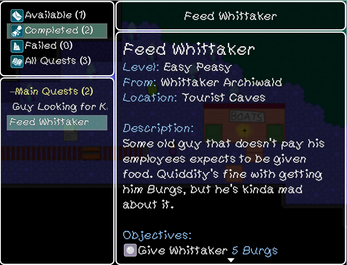 So yeah, here's what people will be getting of Treasure Quest!!. Consider its flaws my punishment for my hubris. Q: What did you have planned for the future? Quiddity finds himself inside a coral reef house, rescued by this walking jellyfish named Ludo. They live on the outskirts of their fellows' small settlement, which is very steeped in tradition. 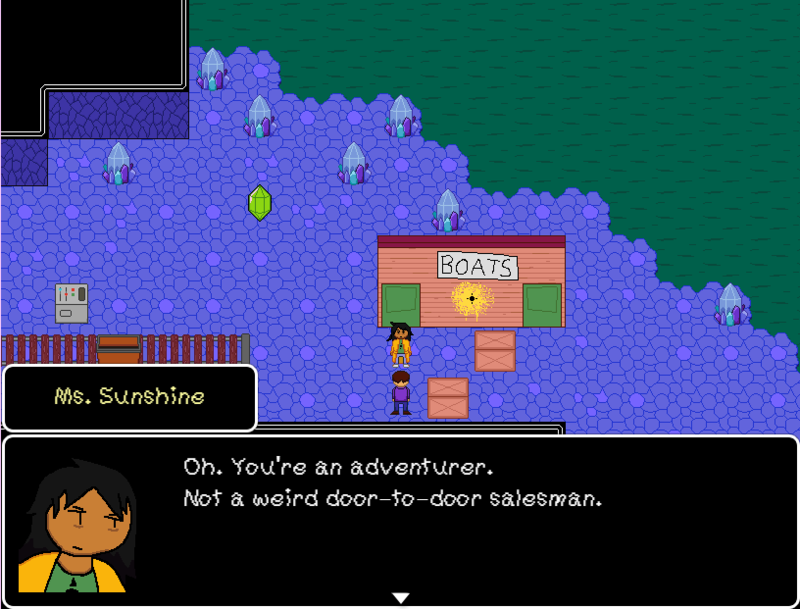 Ludo becomes the second party member, with dreams of breaking out of their circle of society and seeing the world beyond - but they also have other reasons for wanting to leave their town. Ludo's main weapon is books and their list of skills that they learn are far more varied than Quiddity's. They would also use MP instead of Quiddity's TP. To get back on the proper path, Quiddity and Ludo have to start climbing Babel, a mysterious tower that runs through the underground that connects the various civilizations that's believed to have been built by the same people that made the mysterious statues. But they have to deal with bureaucracy first, so they register as a team with the Adventuring Association (player can name it whatever). The sidequests and later optional goals in the game would factor into this reputation system that gives the team more clout in the adventuring world. How exactly would I do that and to what extent? See, this is feature creep in the work, fellas. Steve will have abandoned his persona as "The Dude," realizing that it's kinda lame and tasks Quiddity to find him some different gear again. 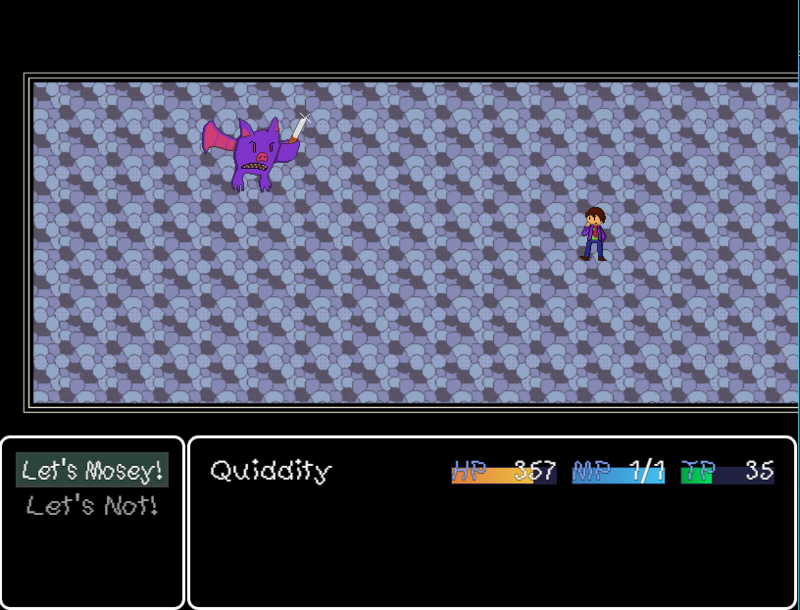 He admits to Quiddity his insecurities about his identity and that he went into the caves to prove himself to others; his initial claw weapon is also cosplay based on a show he watched - Quiddity encourages him to stick by it. He can also be challenged to a spar. Whittaker is hesitant about keeping the group around, but is excited about investigating the statues. 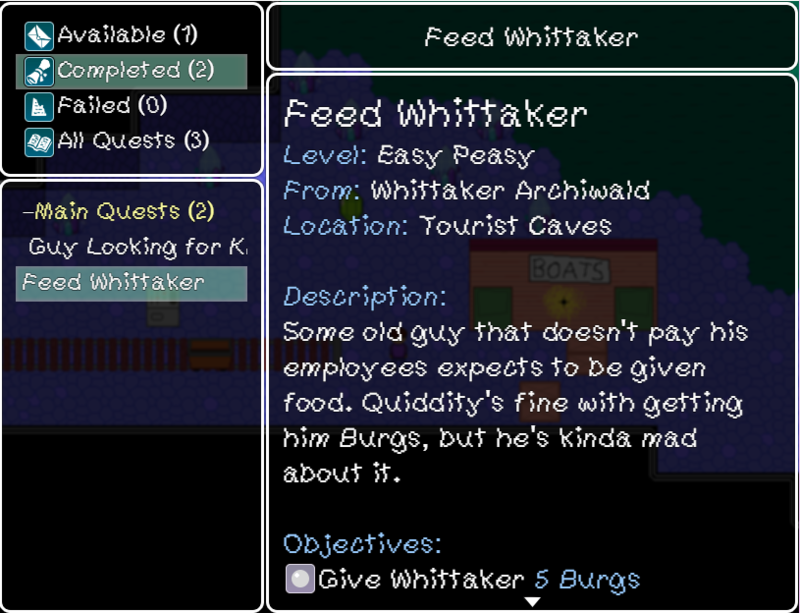 He tasks you with finding an artifact from the dungeon, and doing his quest leads to him not paying Quiddity again. You can rematch a stronger, fully awake Ms. Sunshine to get reputation. Q: What was supposed to be in the rest of the display cases at the beginning?